The clock ticked to 39:59 and I could see the 10K finish line. Alas, I still had 400 metres to go in today’s Great Ireland Run, and I eventually ran in for a finishing time of 41:22. But that 41:22 is a new 10K personal best time for me, and on a course with a hilly second half and strong, swirling winds from start to finish. In the first kilometre we even had a shower of hail. I wasn’t gunning for sub-40 today either, so a new PB is a good return from the race. In fact, my time today is a minute and 17 seconds faster than my time in last year’s edition. The tantalising glimpse of a world under 40 will only encourage me for future efforts. Today’s race came only four weeks after my run in the Tralee Marathon and its pre-race chest infection, so that’s another reason I’m glad of today’s good show. I’ve been sluggish these last few weeks – and an unexpectedly tough parkrun in Tralee last Saturday, which I had hoped would blow out some cobwebs, added to my uncertain feelings. At least the warm weather of these last few days in Dublin had cooled somewhat for race day, and there was some cloud cover to keep the sun out of our eyes. But in return we got strong westerly winds which would be blowing across us for the first stretch and into our faces for the second-half hills. So, with some trepidation I stood at the start. The elite women set off first, and then after the surreal interlude of a priest singing a version of a Eurovision-winning song, the elite men and main field set off up the slight drag of Chesterfield Avenue, the main thoroughfare through the Phoenix Park. No sooner had we left the shelter of the start area than that blustery shower of hail entered from stage left. Up went groans and loud sighs; this would be a hard day for us all. Turning onto the North Road for the second kilometre, we had the wind behind us. This is the flattest and blandest part of an otherwise undulating and stimulating route, but it lets you slip into a good rhythm. Unless, though, you’re the guy just up the road from me who stopped twice to tie his left shoelace – and both times stopping in the middle of the road. I went through kilometres two and three at a steady pace of 4:04. The fourth kilometre is downhill along the sheltered Khyber Road, so everyone should have made up a few seconds here. Just before halfway we took a sharp right turn at the Magazine Fort – the first of three climbs in the second half of the race. And if hills weren’t enough, we were also heading into the wind. At the five-kilometre marker I went through in exactly 20:00, and while the hills and wind ahead lessened any chance of me kicking on for 40 minutes, I had the small consolation of beating by 50 seconds my time at that point in last year’s race, and by four seconds my parkrun time from the previous Saturday. Through the S-bends of kilometre 6 a smaller runner decided to beat the wind by drafting behind me. But this runner was sticking closer to me than my shorts, so I kicked on a little to get some space. I had no joy with my own efforts at drafting – the wind seemed to swirl around even the stockiest of runners. For most of the second half of the race I didn’t look at my watch; I knew I was somewhere between not getting under 40 minutes and still finishing comfortably under my current PB of 41:59. Into the last kilometre, I was still able to run in hard for the finish – but seeing my watch tick past 40 minutes within sight of the line took the metaphorical wind out of my sails. Happily, the literal wind was behind us on the finishing straight. So, I came away from this year’s Great Ireland Run with a steady performance and a new personal best time. More importantly, though, I’ve got a taste of a new objective, and perhaps on a faster course and calmer day I can have a real crack at 39-something for 10K. Regular readers here will know that I run marathons not for the medal or the sense of achievement, but as a 26.2-mile warm-up for my next 10K race. Last autumn, two weeks after the Dublin Marathon, I set a new 10K PB at the Run in the Dark event in Dublin. And this weekend I’ll be hoping to do something similar with my spring season – four weeks after my Tralee Marathon performance I’m lining up at the Great Ireland Run in the Phoenix Park. Even after four weeks of post-marathon resting, punctuated by the occasional light trot, it wouldn’t be true to say I’m back to top form. Last Saturday I dragged the body back to the scene of the crime and did the Tralee parkrun – I found it a slog and just missed out on a sub-20-minute time, which was frustrating. That said, Tralee is a slow course that includes three 180-degree out-and-back U-turns, and I still finished only 6 seconds down on my previous time of 19:58. But it felt like a slog and that’s usually the takeaway point from such runs. And the second half of the Great Ireland Run route is a stern challenge, taking in the hilly west side of the Phoenix Park. However, I know this route well, from last year’s event and the many other Phoenix Park races that share the same roads, and on a tough course that’s a great advantage. Plus, for my Tralee Marathon training I did my long runs in the Phoenix Park and took in the full Great Ireland Run course. And if anything is guaranteed to work up my battle fever it’s a race in the Phoenix Park, especially the finishing straight on the Furze Road. I really want to get under 40 minutes for a 10K, but that’s a 2-minute improvement and it won’t be happening tomorrow. A new PB would be a good result, though – and then for that sub-40 I might prepare with two marathons. 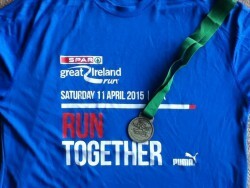 Tralee Marathon 2015 – finished! In the Kerry colours too. I had struggled to get to the start line, and getting to the finish line proved to be no easier. But I still finished the 2015 Tralee Marathon in exactly 3 hours and 49 minutes. Given that I was sick in bed with a chest infection last weekend and I was taking antibiotics up until yesterday, I’m happy with that. Even aside from it being my hometown marathon, it was an excellent race and day. The weather was chilly and we faced a stiff breeze from miles 20 to 23, but otherwise the conditions were excellent – all the better to enjoy some spectacular views as the route passed along the scenic Tralee Bay coastal roads. This was also my first time running in a smaller-sized marathon. Only 360 runners took part in today’s marathon, which means that it was 100 times smaller than the three times I ran in the Paris Marathon. With the smaller scale came a more laid-back vibe – and I liked it. The crowds and bustle of big-city marathons, added to the need to be at the start area at stupid o’clock in the morning to avoid long queues, can make it hard to relax – an essential part of running well. My race plan in Tralee today was simple; make like Rosa Parks and not budge from my seat on the 3:30 pace bus. For most of the race this went like a dream; I felt comfortable and as we passed through four miles in a manageable pace I was almost giddy with excitement. The route took us out of Tralee in a north-west direction. After a few miles of rural main road we came to the historic village of Ardfert, home to St Brendan the medieval seafaring priest and apparently the ‘real’ discoverer of North America. (An expedition in the 1970s recreated his voyage and showed it was possible to cross the Atlantic in a tar-coated, leather-hulled boat.) Ardfert is also the home of Tom O’Riordan, 1964 Olympian and esteemed athletics journalist. His son Ian is now the athletics correspondent for The Irish Times. By Ardfert our pace group had settled into a nice gang of around ten runners. The roads weren’t closed to traffic, but drivers were careful and none of us were discommoded or spooked by any vehicles. After Ardfert came another historic spot – Banna beach, where Sir Roger Casement was arrested for treason after landing with arms for the 1916 Easter Rising. For those of us from Tralee, Banna is the local beach and while running along the strand road today I saw some of the high dunes from which I would take flying leaps into the soft sand as a youngster – an early effort at long jumps. The ten-mile marker reached us bang on 80 minutes, and I felt fine; there didn’t seem to be any ill-effects from my chest infection. We swung back close to Ardfert, and then towards the halfway point of the race we faced into the rolling hills around Barrow. The steep hill out to Barrow itself was on last year’s route and caused great hardship – but this year it wasn’t on the course. Still, the undulating road made us all focus on feeling comfortable and bottling some energy for the last part of the race. Another hilly road took us to the small port of Fenit, where a looped turn would send us back towards Tralee for the last six miles of the race. Alas, this was where I started to fade. Just after the 20-mile marker I started to feel heavy-legged and light-headed. My breathing felt a little heavier, which brought to mind my recent chest infection. Added to that, a stiff onshore breeze started blowing into our faces. I had a choice to make; should I force myself to keep up the pace, or should I be cautious given my recent illness? Common sense prevailed: I parked the ego, cut my losses and figured that I’d be happy to enjoy the run-in, guarantee a decent time and protect my fragile health. And so I slipped out the back of the 3:30 group and watched them head off into the distance and out of sight. I travelled the last six miles at little faster than walking pace, which didn’t make it any easier. My revised plan was to save some energy for the last two miles, which were mostly downhill into Tralee town. The 3:45 pacer passed me; I kept my head down until the coast was clear. Along I trundled, and a mile and a half from the finish, just before we reached Tralee, I did something I had never done in a race before – I took some food from spectators. It was a Jaffa cake, to be precise. I needed some energy and a psychological lift, and I figured that I was close enough to the end to risk some food clattering into my empty stomach. As it happened, the Jaffa cake was delicious and went down like a dream. As soon as we swept downhill through the outskirts of Tralee, I got a second wind and I kicked for home. The thrill of finishing a marathon in my home town sent a surge of electricity through my legs. (It was that or the Jaffa cake.) Rounding the corner into the second-last street, I saw my family waving and cheering – another thrill for me, as it was the first time they had seen me run in a marathon. All that was left was the finishing straight on The Mall. And I had it all to myself, with no other runners near me – this was a dream scenario. Neighbours from my home town cheered me on as I kicked like a mule and drove for the line. It was the greatest finishing straight I ever ran. I crossed the line in exactly 3:49:00. Afterwards I was freezing cold, and when I got home I had trouble warming up again. But a power nap soon got me back in shape. If you can have a hard 20-mile crash and a slow time but still feel you had a great race, then I had that race today. I’d recommend everyone run their home town marathon. A marathon consists of two challenges. One is getting to the finish line, and the other is getting to the start line. I’m almost at the start line of my ninth race over the classic distance, the Tralee Marathon. Race day is on Sunday morning, the day after tomorrow as I write. This time last week, though, the Tralee start line threatened to recede into the distance. A heavy cold mutated into a mild chest infection, and I could hardly lift a leg even to shuffle forlornly to the couch to console myself with football on TV, I feared that for Tralee I would literally be a non-runner. Thankfully I was able to start zapping the chest infection with antibiotics while it was still a mild irritant in my windpipe, before it could plough down into the lungs. I’m also thankful that my doctor is officially Sound On The Running Question. When I told her I needed to get well for a marathon the following weekend, instead of furrowing her brow and sighing in exasperation she asked me what time I was aiming for. But then, this is the same doctor who patched me up when, two days before the 2013 Dublin Marathon, I rocked up to her clinic with mild gastroenteritis. Forty-eight hours later I ran what is still my marathon personal best time. After seven days without running, during which I slept like a sleeping machine, this week I had a couple of tentative runs. On Tuesday night I went out for a speculative twenty minutes of light trotting – two ten-minute miles. By merely returning without having coughed up my lungs I considered that run a success. Then on Thursday night I wrapped those two slow miles around a filling of two miles at race pace. It felt comfortable and I was greatly heartened, if not so greatly lung-ened. Right now the infection seems to have cleared up. I have a light, dry ‘ahem’ of a cough like that of a groom trying to shut up a bawdy best man’s speech at a wedding reception. So now I’m getting ready for race day. Tomorrow morning, 24 hours before the start, I’ll go for my traditional captain’s run – a light run of one mile the day before a race to loosen the legs and work up some battle fever. Then I must collect my race number: I’ll be number 60. After that I’ll just be resting up, plus going over my race strategy. Although my legs are in the shape to go for 3:14 or even 3:09, I’m not so steady on my lungs. So for Tralee the plan is to sit in with the sub-3:30 bus and see how the windbags hold up. The main objective is to finish in a decent time but without my lungs oozing down the front of my shirt, and this may require concepts alien to most of us male runners, such as common sense and parking the ego. And then on Sunday morning I’ll make my way to the Tralee Marathon finish line – via the start line. It’s spring marathon season, and for us here in the English-speaking corner of Europe that means one race. Many runners are training hard and visualising intently for their glorious finish down The Mall. That includes me. Yes, in a few days time, current illness notwithstanding, I’ll be blasting out a glorious run at the Tralee Marathon in Co. Kerry, Ireland. Oh, there’s the London Marathon too, and that also finishes on The Mall. If you know London, then you’ll know The Mall is the long, wide boulevard of red tarmac that sweeps from Trafalgar Square up the the gates of Buckingham Palace. Apart from London Marathon day, our British friends can be found on The Mall waving their Union Jacks on the occasion of some royal good news. The Mall in Tralee is less spectacular; it’s the main shopping street in the heart of town. Back in the 1980s, when I was in shorts, it was a bustling two-way thoroughfare. Fast forward to today, when I’m still in shorts, and it’s a slightly quieter one-way street; an out-of-town shopping mall has hit The Mall. But the bustle will be back on Sunday morning. The Tralee Marathon wasn’t due to finish there. On last year’s course and this year’s intended course, The Mall was the second-last street before a right turn onto the finishing straight down the wide Georgian thoroughfare of Denny Street. I had been visualising this finish since Christmas – in fact, during my Christmas morning run in Tralee I took the opportunity of a practice finish down a deserted Denny Street, to help me visualise it all the better. “Ha! So much for your visualisation!” says you. Well, as it happens, I had already practised my 2015 spring marathon finish on The Mall – the London version. Regular readers will remember that I took a long run in London one sunny Saturday morning last September. At that stage I had entered the ballot for London Marathon places and was awaiting the result. Well, on that London run I made sure to get in some practical research – heading back from Tower Bridge and along the Victoria Embankment, I hung a right at Big Ben and followed the last couple of miles of the London Marathon course. Now, it mightn’t be apparent to you why practising the finishing straight of one marathon can help with the finish of a different marathon just because they finish on streets of the same name. All I can say to that is: if you’ve got to ask, then you’ll never need to know. Enjoy your spring marathon finishing kick down The Mall, wherever it may be. And one reminder to anyone doing the Waterford Viking Marathon in Ireland in June: you’re starting on The Mall, not finishing there. Waterford is an odd place. Just because you’re maranoid, it doesn’t mean the world is not out to get you during your marathon taper. With only nine days to go to the Tralee Marathon, I’m sick. I have whatever version of the cold bug is pinging around Dublin these days. The day before yesterday I could feel myself a little drained and slightly light-headed. I made for the paracetamol and liquids, but in vain. Yesterday morning, when I woke up to get ready for another day down the coalmine, my head was reeling, my throat was rasping and I hadn’t an ounce of strength in my body. There would be no coalmining yesterday – nothing of anything except medicine, fluids and bed-rest, interrupted only by the necessity to get up and watch the previous night’s recording of Match of the Day. I feel a bit better today. I made it back to work, for one thing, and got from nine to five without falling into a heap. It’s the weekend now, so I’ll rest up and focus on getting back to full health. My main concern is to make sure I don’t get a chest infection – after previous marathons I’ve been susceptible to bronchitis, and getting another blast of it now would put an end to my hopes of running in a marathon next weekend. Of course, it’s frustrating to be sick and unable to run so close to my marathon. But the enforced rest might be a blessing in disguise – I’ll be able to catch up on my sleep and avoid the risk of overtraining. A few days without running won’t cost me my fitness, especially since my substantive training is already done. By the end of this weekend I hope to be fully recovered and back on my feet again. Otherwise I shall wreak my vengeance by hopping from rush-hour bus to train and spluttering on every commuter in Dublin. Tralee Marathon 2015 – I’m in! My parkruns and cross country so far in 2015 were fine in themselves, but they were all part of a greater plan. I’ve entered the Tralee Marathon, taking place on 15 March. Tralee is my home town, and ever since the first edition of this race in 2013 I’ve wanted to run this marathon. What’s more, I’ve heard only good reports about the organisation and atmosphere of the event. If I’m honest with myself, another motivation for running this marathon is my rough experience at the 2014 Dublin Marathon last October. I had trained and raced well all summer, but then on race day I had a shocker – I blew up with ten miles to go and finished half an hour outside my target time. While I was happy to have hung on to finish with a decent time of 3:38, a part of me felt disappointed at my poor showing. Tralee isn’t going to be a PB chase – I just want to have a more enjoyable marathon than I had in Dublin. So, a spring marathon for me – my first since a great run at Paris 2012. For fear of a Dublin hangover I’ve prepared myself gradually. Notwithstanding my PB-setting 10K in November, I took the post-Dublin month to recover and return slowly to running. My post-marathon slump continued into December, but by then I had already thought of Tralee the following March. So, I used December as a tentative base-building period, with a view to taking my training one month at a time. A good Christmas rest got me feeling refreshed for January and those fast short races to build up speed and strength. February training has gone well too, and last October’s Dublin Marathon seems like a long time ago. So now there are less than three weeks to race day in Tralee, which means I’m tapering already. I feel well-prepared physically and mentally, and quite relaxed about the prospect of a marathon in 20 days time. Also, as my previous eight marathons have been in the big-city races of Paris and Dublin, a less-crowded event and a mostly rural course will be a refreshing change for me. Receive each new post by e-mail!